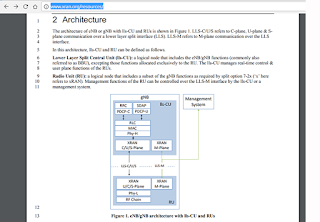 The xRAN Forum (xRAN) announced the approval and release of the xRAN Fronthaul Control, User and Synchronization (CUS) Plane Specification Version 2.0 and the xRAN Fronthaul Management Plane (MP) Specification Version 1.0. 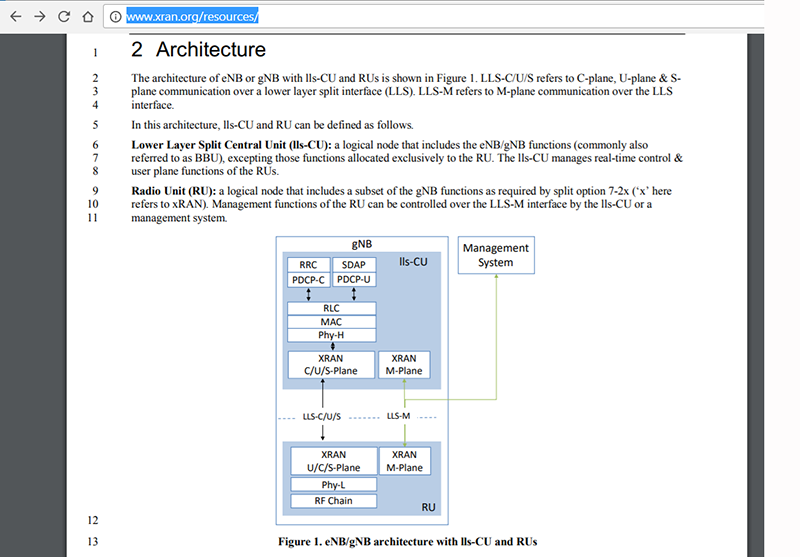 The approvals allow vendors to develop new RRUs and BBUs for a wide range of deployment scenarios, which can be easily integrated with virtualized infrastructure & management systems using standardized data models. 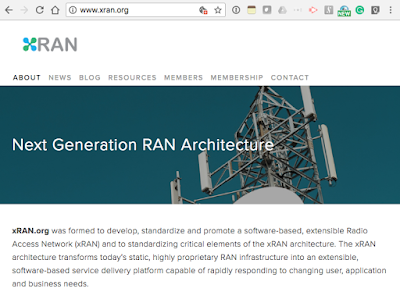 The xRAN Forum, was established in October 2016 with the mission to enable best-of-breed RRUs and BBUs for a wide range of deployment scenarios, is in the process of merging with the C-RAN Alliance to form the ORAN Alliance, which is backed by AT&T, China Mobile, Deutsche Telekom, NTT DOCOMO, and Orange. Spirent Communications introduced an 8-port 1U-high rack-mountable solution for testing 400/200/100/50 Gigabit Ethernet (GbE). The new pX3 400G Appliance, which is the world’s highest density QSFP-DD tester, is designed to validate the forwarding performance and quality of service of ultra-high-scale, next-generation-enabled, multi-terabit routers and switches, all contained in a single rack space. The pX3 400G appliance offers 8 ports. Spirent says up to 255 pX3 units can be interconnected to provide synchronized timing for a total of 2,040 ports. 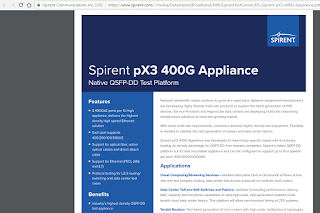 These appliances will interoperate with and complement Spirent’s extensive high speed Ethernet test modules and chassis offerings. 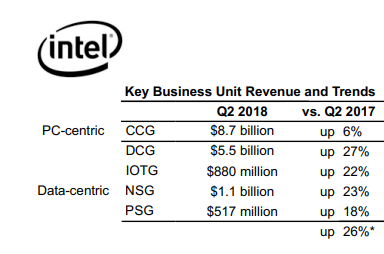 Intel reported record second quarter revenue of $17.0 billion, up 15 percent YoY and driven by strength across the business and customer demand for Intel platforms. Intel's data-centric businesses grew 26 percent, approaching 50 percent of total revenue. PC-centric revenue was up 6 percent on strength in the commercial and enthusiast segments. Intel noted the workload optimization trend in the data center is also fueling demand for FPGAs. Intel's Programmable Solutions Group (PSG) revenue grew 18 percent. Intel's memory (NSG), Internet of Things Group (IOTG) and Mobileye businesses each achieved record quarterly revenue. Mobileye revenue grew 37 percent year-over-year as the adoption of advanced driver-assistance systems (ADAS) increases. 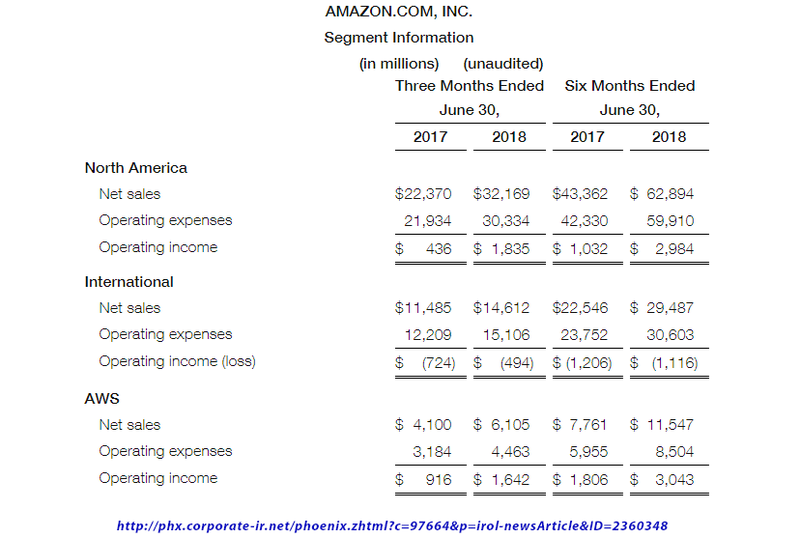 In its quarterly report for the three months ended June 30, 2018, Amazon disclosed that AWS sales amounted to $6,105 for the period, up 49% from $4,100 a year earlier. New enterprise customers announced during the quarter include Ryanair, Epic Games, zulily, 21st Century Fox, Verizon and its subsidiary Oath, Major League Baseball, and Formula One. AWS announced the general availability of Amazon Elastic Container Service for Kubernetes (Amazon EKS), a fully managed service that makes it easy to deploy, manage, and scale containerized applications using Kubernetes on AWS. AWS announced the general availability of DeepLens, a deep learning-enabled wireless video camera built to give developers hands-on experience with machine learning. AWS announced the general availability of Amazon Neptune, a fast, reliable, and fully-managed graph database service. With Amazon Neptune, customers can efficiently store and navigate highly-connected data, allowing developers to create sophisticated, interactive graph applications that can query billions of relationships with millisecond latency. 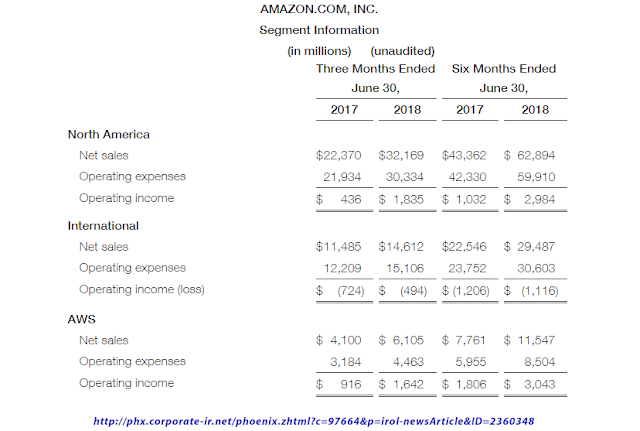 AWS announced pay-per-session pricing for Amazon QuickSight, the first business intelligence service with pay-per-session pricing. Amazon QuickSight is a fast, cloud-powered, business analytics service. AWS announced a new Amazon Elastic Compute Cloud (Amazon EC2) instance for AWS Snowball Edge devices (SBE1). AWS Snowball Edge is a 100TB data transfer device with on-board storage and compute that can be used to move large amounts of data into and out of AWS, as a temporary storage tier for large local data sets, or to support independent local workloads in remote locations. AWS announced the general availability of C5d Instances with Local NVMe Storage and I3 Bare Metal Instances, two new features which are part of the Amazon EC2 service within AWS’s compute portfolio. 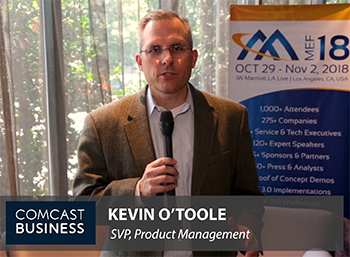 C5 Instances with Local NVMe Storage bring customers high-speed, ultra-low latency local storage to compute-intensive C5 instances. In its second year of availability, the number of databases migrated to AWS using the AWS Database Migration Service has grown to more than 80,000 databases. AWS announced the general availability of Amazon Sumerian, a new managed service that allows developers to create and publish augmented reality (AR), virtual reality (VR), and 3D applications. Nokia reported net sales in Q2 2018 of EUR 5.3 billion, down 5% compared to EUR 5.6 billion in Q2 2017. On a constant currency basis, net sales would have been down 1%. 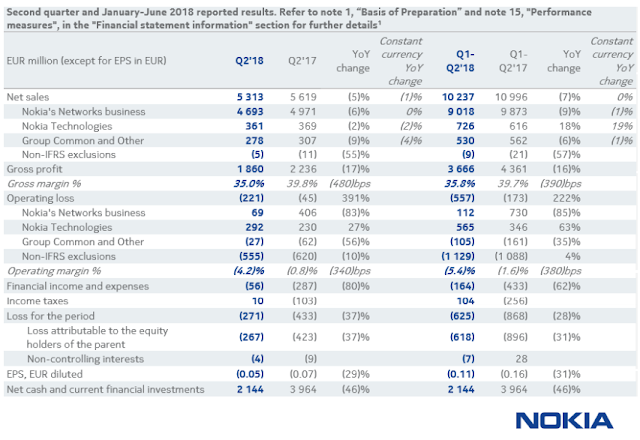 Non-IFRS diluted EPS in Q2 2018 was EUR 0.03, compared to EUR 0.08 in Q2 2017. The company expects commercial 5G network deployments to begin near the end of 2018. 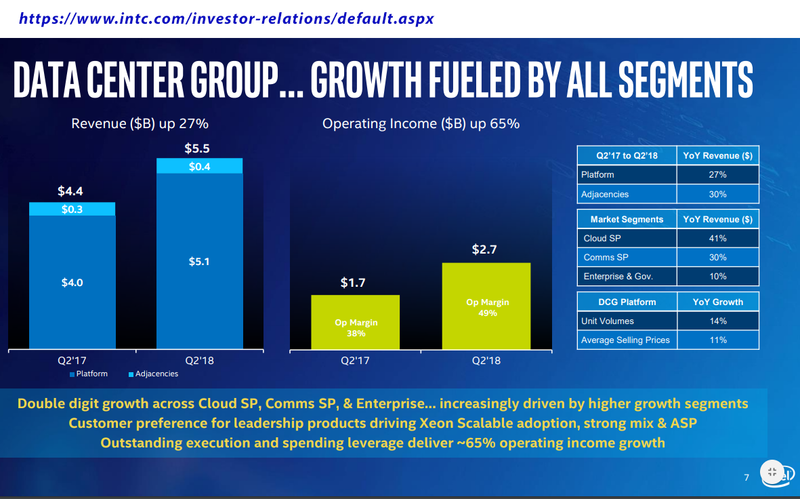 Strong momentum continued with large enterprise vertical and webscale customers, with double-digit year-on-year growth in net sales. Approximately 40% of sales pipeline now comprised of solutions, products and services from multiple business groups. Strong track record maintained, with 23% year-on-year growth in recurring licensing net sales and 27% year-on-year operating profit increase in Q2, primarily related to license agreements entered into in 2017. 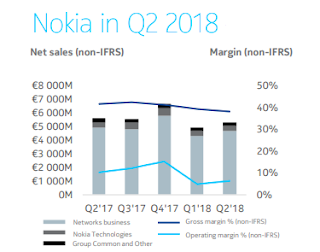 Nokia Technologies continued to make good progress on new licensing agreements; no major agreements were announced in Q2. "Nokia’s Q2 2018 results were consistent with our view that the first half of the year would be weak followed by an increasingly robust second half. Pleasingly, I am able to confirm that we expect to deliver 2018 results within the ranges of our annual guidance." "Our view about the acceleration of 5G has not changed and we continue to believe that Nokia is well-positioned for the coming technology cycle given the strength of our end-to-end portfolio. Our deal win rate is very good, with significant recent successes in the key early 5G markets of the United States and China." 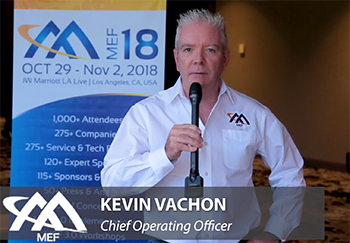 "The installed base of our superb high-capacity AirScale product, which enables customers to quickly upgrade to 5G without a hardware swap, is growing fast. And, the strength of our end-to-end portfolio remains a differentiator. When you look at our sales pipeline, 40% of it is now comprised of end-to-end deals. That is the highest level we have seen to-date. " CyrusOne has purchased land and a newly-built, powered shell for an enterprise data center in Sterling, Virginia -- its fourth data center campus in the region. The first phase of the facility should be ready in Q1 2019. It will eventually provide 33 megawatts of available power. The new data center brings CyrusOne’s total power capacity in Northern Virginia to over 160 megawatts. "Hyperscalers demand warp speed, and we’re proud to be accelerating from zero to 160 in Northern Virginia, driven by demand from cloud and enterprise customers," said Tesh Durvasula, chief commercial officer, CyrusOne. "Our land acquisition, development, construction, and capital markets teams continue to execute at a level unmatched in the industry to produce the inventory necessary to meet the ongoing need for new capacity in Northern Virginia and other key markets." 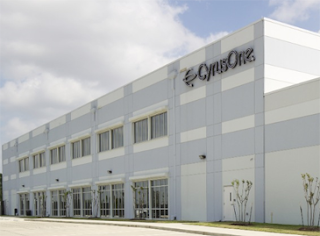 CyrusOne operates 45 data center facilities across the United States, Europe, and Asia. Alibaba Cloud launched its second cloud availability in Malaysia. The new zone complements Availability Zone A, which was launched last year. 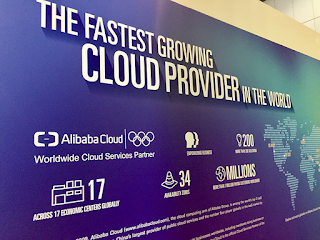 Alibaba Cloud also plans to open the first cloud-based Anti-DDoS Scrubbing Center in Malaysia in August. “I welcome Alibaba Cloud’s effort to further support and enhance Malaysia’s digital economy. The world moves ever closer towards e-commerce and we see a considerable surge in demand by local industries to participate in this new economy on a global platform. Malaysia is now pushing ahead with efforts to strengthen its infrastructure with a view towards making access to the Internet a basic human right and categorising facilities which enhance access to broadband as a public utility,” said Gobind Singh Deo, Malaysia’s Minister of Communications and Multimedia. A new Open Community for Ethics in Autonomous and Intelligent Systems (OCEANIS) has been formed to focus on standards as a means to address ethical matters in autonomous and intelligent systems. IEEE and the IEEE Standards Association (IEEE-SA) are founding members.